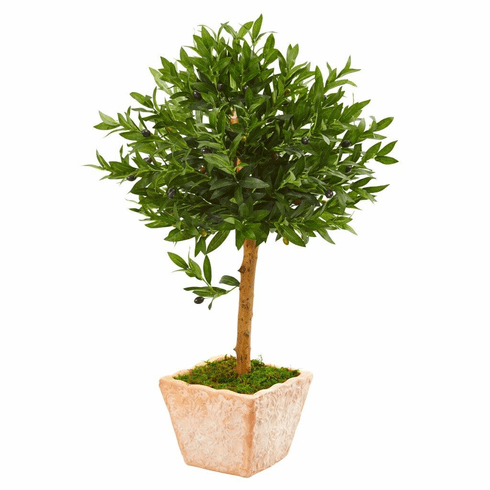 Comes fully UV-resistant, this 3’ olive topiary artificial tree's classic beauty will instantly bring sophistication to any indoor or outdoor space you placed it in. Featuring a lush head of green leaves sitting atop a thick brown trunk, this three-foot ornament will maintain its lifelike appearance and will never outgrow its shape even without the upkeep. Place it in a sunny spot in the sun room or position it in the entrance door to greet everyone with a calming vibe. A terra cotta planter filled with green moss is included. Height: 3 Ft., Width: 26 In., Depth: 26 In., Color: , Pot Size: H: 7.5 In. W: 9.5 In. D: 9.5 In.